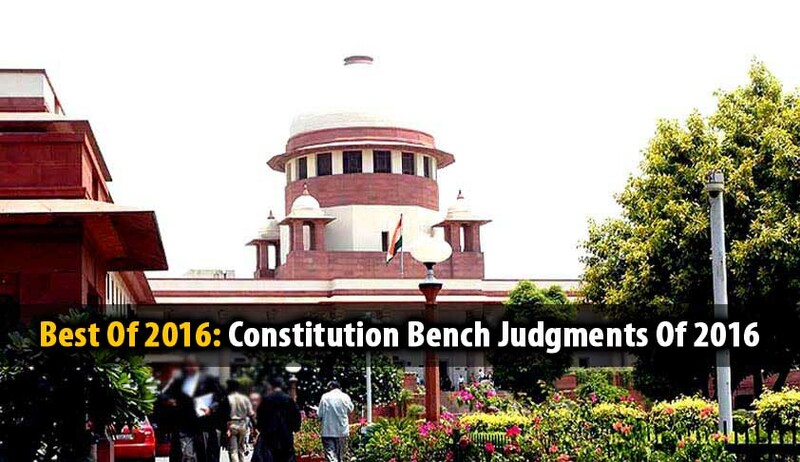 Nine Constitution Bench Judgments were rendered by the Supreme Court of India in 2016. Nine Judge Constitution Bench upheld the constitutional validity of Entry Tax imposed by States on goods coming in from other states. The Bench also directed the three Judge Bench to decide whether the States’ entry tax laws on the basis of Guidelines issued by this Bench. A Constitution Bench of the Supreme Court had allowed the Review Petition in Medical Council of India Vs. CMC Vellore [Review Petition (C)Nos.2159-2268 of 2013 and thereby the Regulation framed by MCI with prior permission of the Central Govt. for holding of the Common Entrance Test for admission to Medical Courses in India both in private and Government Medical Colleges stand revived. Constitution Bench of the Supreme Court of India held that while multiple sentences for imprisonment for life can be awarded for multiple murders or other offences punishable with imprisonment for life, the life sentences so awarded cannot be directed to run consecutively. The Bench further clarified that such sentences would, however, be super imposed over each other so that any remission or commutation granted by the competent authority in one does not ipso facto result in remission of the sentence awarded to the prisoner for the other. The Bench also corrected the wrong interpretation given to Section 31(2) of Code of Criminal Procedure Code, by holding that the cap of 14 years Rule on aggregate punishment is not applicable to Sessions Court. The Supreme Court restored the Congress-led Nabam Tuki government. The Bench termed as “illegal” and “violative of constitutional provisions” Governor J P Rajkhowa’s advancement of the Assembly session from its scheduled date of January 14, 2016 to December 16, 2015 in order to remove Speaker Nebam Rebia that had triggered the entire political crisis leading to the imposition of President’s Rule on January 26. The Court ruled that all the actions of the Governor was violative of article 163 of the Constitution. The Constitution Bench upheld the constitutional Validity of M.P. Niji Vyavasayik Shikshan Sanstha (Pravesh Ka Viniyaman Avam Shulk Ka Nirdharan) Adhiniyam, 2007 (M.P. Act No.21 of 2007) and various Rules enacted by the Madhya Pradesh Government primarily to regulate the admission of students, fixation of fee and reservation in Post Graduate Courses in Private Professional Educational Institutions in the State. The Bench held that that the occupation of education cannot be treated at par with other economic activities. In this field, State cannot remain a mute spectator and has to necessarily step in in order to prevent exploitation, privatization and commercialisation by the private sector. Constitution bench of the Apex Court held that no private Bus operator can operate his vehicle on any part or portion of a notified area or notified route unless authorized so to do by the term of the scheme itself. The Bench held that the private operators may not operate on any part or portion of the notified Route or Area on the mere ground that the permit as originally granted to him covered the notified Route or Area.